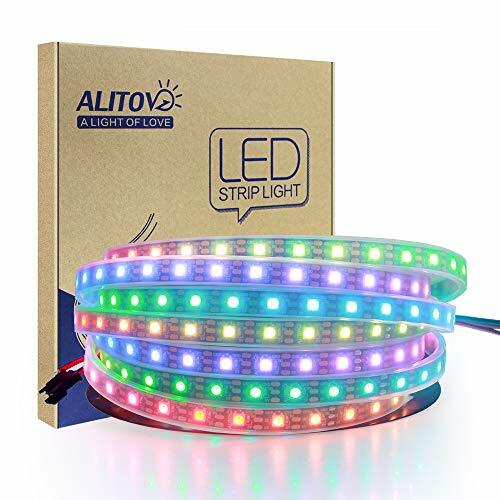 Kindly note: The LED strip comes without power supply and controller. 1) You must use a 5V DC power supply to power these strips, do not use higher than 6V or you can destroy the entire strip. 2) Led strip is made by 50cm FPCB, so there is a solder point each 50cm on strip. But this minor flaw has no any bad effect on the strip's performance. In fact, most of the LED strips on the market are manufactured in half-meter lengths. It can be programmed with Arduino, FastLED library, Raspberry Pi, Fadecandy, T1000S etc. It can also be controlled by SP105E, SP103E, HC008 and other pre-programmed WS2811 controllers. Covered with silicone weatherproof sheathing, which protects it very well and makes it easy to clean. It comes with clips and screws and can be installed easily. Come with 3pin JST-SM connectors and separated power/ground wires on both ends. Each LED can be cut off without damaging the rest strip. You can shorten, lengthen or bend it freely if you want. Used to make led screen, led wall, advertising board and widely applied to hotel, KTV, bars, Outdoor advertising signs, Christmas or wedding party decoration, and so on. If you have any questions about this product by ALITOVE, contact us by completing and submitting the form below. If you are looking for a specif part number, please include it with your message.